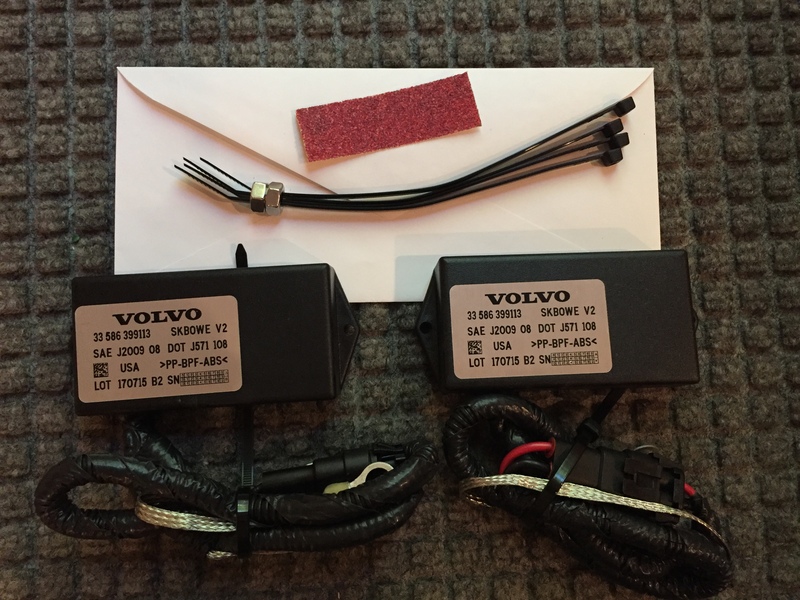 The SKBOWE PWM Filter is the only plug-n-play harness that lets you safely run any aftermarket HID kit on the low beam circuit of Volvo C30, S40, V50, or C70 (P1 Chassis) vehicles originally equipped with halogen (H7, H11) headlights. The SKBOWE is an open-source project designed by a Volvo S40 owner and enthusiast in 2016. 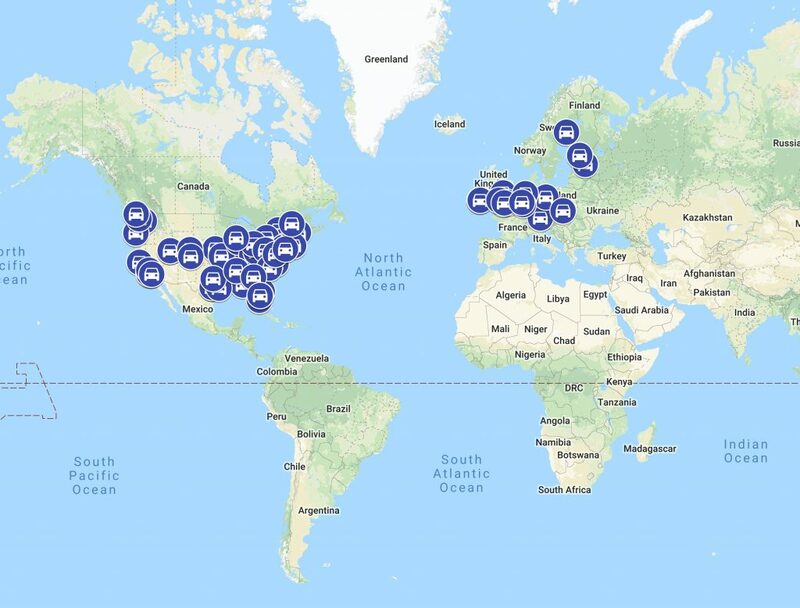 While the goal of this site is primarily to provide accurate information on P1 HID retrofitting, as a service to the Volvo community, one hundred (100) SKBOWE units total will be manufactured and sold at cost. The Volvo P1 chassis vehicles that came factory-equipped with halogen headlights have solid-state controls in the CEM (Central Electronic Module) that uses 82Hz PWM (Pulse Width Modulation) for low-beam voltage regulation, with duty cycle mapped to the system voltage – usually around 85-90%. The off-time with this low-frequency PWM exceeds the “hold-up time” in most aftermarket HID retrofit ballasts, causing the ballast to try to re-ignite the bulb many times per second. Depending on the ballast, this may prevent them from working completely or cause them to flicker, flash, or wobble. In the worst case, HIDs can send high-voltage EMI through the a common ground point and destroy a sensitive chip inside of the WMM (windshield wiper motor) computer, causing the wipers to go crazy. You can learn more about the issues here. Note that if your car came with “bi-xenon” or “ABL” headlights (look on the headlight housing for the letters “D2S”) then you do NOT need a SKBOWE as you have the factory “HID” bulbs. Please don’t ask if it will work for another type of vehicle! I have owned Volvos for 15 years and am not interested in helping you with your other Make/Model. I want HIDs! What can I do? I have not seen any commercial “error eliminators” that meet the difficult P1 PWM input requirement 1 . A relay harness is workable, but will result in a Warning triangle and “Bulb Failure Low Beam” message on your DIM (gauge cluster) unless you install load resistors, which is an awful waste in my opinion. The right answer is a capacitive PWM filter with an auxiliary ground to safeguard the WMM, and so was born the KBOWE in 2009. I waited patiently for 8 years for someone to commercialize this design. It was sent to multiple HID resellers and OEMs, but nobody seems interested in our tiny P1 market – so I decided that there is no choice but for me to build some of them myself. The SKBOWE was designed specifically for the Volvo P1 chassis vehicles: S40, V50, C30, and some C70. There is no need to get one if you don’t have a P1! Some of these vehicles came equipped with factory Bi-Xenon projectors, the SKBOWE is only required for cars with factory Halogen headlights. 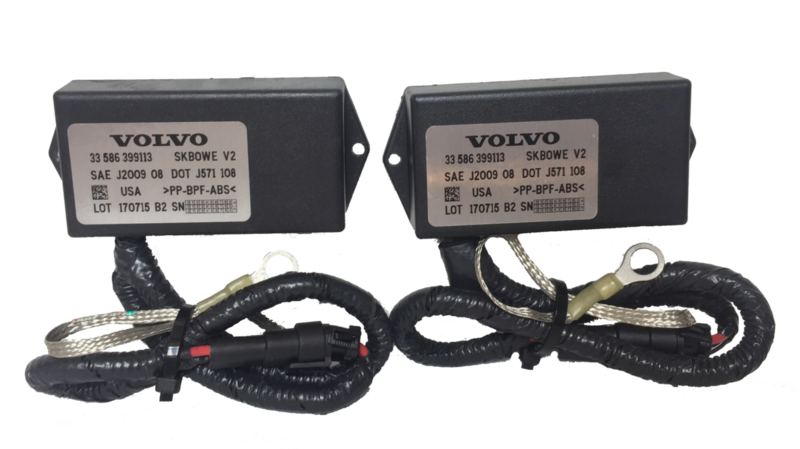 The SKBOWE is designed for both 35W and 55W HID retrofit ballasts of all brands, allowing them to work in P1 Volvos with out triggering “Bulb Failure Low Beam” errors during normal operation 2. They work by filtering the low-frequency PWM pulses to a smooth DC voltage, as if the ballast was hooked straight to the battery. A flyback diode and a separate ground connection completely eliminates back-EMF that can damage the WMM. Each SKBOWE unit has five (5) parallel high-quality extended-temperature airbag-rated 35V 8.4mF capacitors (42mF total)3, redundant (2x) 20A diodes, and marine-grade (high-strand-count) tinned wire, all in a fully potted ABS enclosure. There is a minimum 200% safety margin on all components! Note one order/”pair” = 2x SKBOWE units. The technical specification is < 500mV ripple at 5A with 13.5V in 80% duty cycle 82Hz, and < 500mV drop at 5A DC. The outer dimensions measure 4.00 x 2.13 x 0.90 in. (101 x 55 x 23 mm) with two mounting tabs on the shorter sides. Operating temperature -55°c – 105°c, capacitor life 80% after 5000hr @ 105c (221F), estimated useful life span > 12000 hours (30MF). Note on the connectors: The 9005/9006 connector is the universal “HID power” connector – still order your HID kit with H11 or H7 bulbs as appropriate for your car. 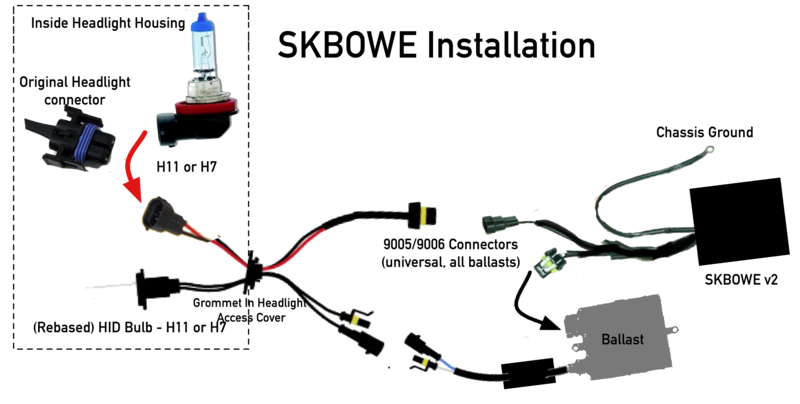 When you order a (for example) H11 retrofit kit, the bulb harness comes with an H11 male connector on the bulb end (to connect to the car inside of the headlight) and 9005/9006 connector on the other end that plugs into the HID ballast – or in this case, into the SKBOWE which plugs into the ballast. The original KBOWE (link) works very well, with over a hundred car-years of success by now, but it needs electronics skills to build and has a fairly difficult installation (cutting CEM wires). The SKBOWE (Split-KBOWE) splits the original KBOWE design into two boxes, instead of one, so it may be located inline with the ballasts in the engine bay without cutting any wires. The plug-and-play convenience comes with a price – the SKBOWE is about twice as expensive as building the KBOWE yourself. For more information on the original KBOWE (DIY), please visit this link. If you can build your own, please do! There are only a limited quantity of SKBOWEs, so it would be good if people who actually needed them could get one. Do you sell a complete Volvo HID kit? The SKBOWE kit for sale on this site is just the “error canceler” or “canbus-harness” or whatever you want to call a large capacitive PWM filter – You will need to buy an HID kit separately – Please see the ballast selection section of the SKBOWE install guide for more details. The SKBOWE will outlast your bulbs and ballasts 4 so it was designed to be universal, reusable when the ballasts need to be replaced. The HID brand does not matter ** – it plugs directly in to to any aftermarket HID retrofit kit (or, can be used with adapters to connect with OEM-style ballasts). No additional relay harnesses, load resistors or error cancelers required – it’s 100% plug-and-play with P1 vehicles. ** Disclaimer: the SKBOWE does not make cheap ballasts less cheap – you get what you pay for. Less expensive ballasts will generally have issues on any car, including color inconsistency, arc instability, and short life spans. Then what do I get? Items included in the SKBOWE kit. You will receive a pair (two) tested serial-numbered SKBOWE modules, two M8-1.25 nuts, four 8″ zip-ties, and a 1″x3″ piece of 3M 60 grit sand paper – See the order page for complete details. The actual install process is explained in the SKBOWE install guide. What about DRL (Daytime Running Lights)? This section talks about the DRLs that reuse the halogen H11 low-beam projector at a lower power (dimmed) during the daytime. If your low-beam headlights turn off when the light switch is in position 0 (or have DRLs mounted below the headlights) then you can ignore this section. If you accidentally leave DRLs on for a short period nothing catastrophic will happen, and in some cases the lights may appear to be working normally. But having full voltage for 60% of the time means that the SKBOWE must draw 40% more current to compensate for the off time – running dangerously close to the 7.5A fuse that protects the headlight circuits for 55W ballasts. While some HIDs MAY run just fine with DRL on, this is very unhealthy for the capacitors in the SKBOWE, and will drastically reduce their life (and void your warranty!). More likely with the SKBOWE, the CEM will shut down the headlights until the car restarts, without a visible warning message. You can learn more about the technical issues related to DRLs on the issues page. What about LED headlight kits? Real LED headlights are sweet. Retrofit LED headlights are not. Specifically, LEDs fitted to H-base (H11, H7) optics are not suitable for street use – this is the overwhelming consensus of automotive lighting experts. Besides always being dramatically dimmer than advertised, and having many cooling issues, it is impossible to form a radially-symmetric filament-shaped light source using planar silicon. The result is an out-of-focus light distribution with way too much foreground light (ruining your night vision) while not getting enough light down the road (so you can’t see as far) and dazzling oncoming traffic. If you understand all of that but want to use LEDs anyway, the SKBOWE will work ONLY if the LEDs draw more than 25 watts, otherwise, you will need load resistors and an anti-buzz relay harness. Be aware that I will not provide support for LED installs with SKBOWE, and please don’t ask me for help designing your LED setup. What about CANBUS (CAN-BUS) HID? A CAN bus is a 2-wire vehicle communication network using the CAN (Controller Area Network) protocol. There is no such thing as an aftermarket “CANBUS HID” – this is terminology abuse, a Chinese “engrish” invention from the early 2000s that is supposed to mean interoperability with newer vehicles that rely on CAN to reduce direct-wired signals, and which typically have digital controls (current monitoring or PWM voltage regulation) on halogen bulb outputs. Despite being wildly inaccurate – a CAN bus ballast would need a 4 wire connection to the vehicle and custom programming for each make/model – and much to the chagrin of Electrical Engineers everywhere, this term has somehow become pervasive in describing both HID and LED that have an integrated “error eliminator”: a high-power load resistor (usually designed to draw several watts) and sometimes an electrolytic capacitor inserted prior to the standard circuitry. More often than not, it is a separate box inline with the 12V power wires, that looks similar to the ignitor molded onto the output wires. To be perfectly clear, any HID product advertising as “CANBUS” will not function correctly on Volvo P1 vehicles without an additional filter like the SKBOWE as described on the issues with CANBUS and other error eliminators page of this site. However, the SKBOWE will work with any HID kit, including “CANBUS” kits – just be aware that they are not at all necessary, or even helpful: you are likely paying more, and drawing additional power, for no added benefit. Delivery dates and availability are listed by batch on the order page. Some of the batch delivery dates are far out; these are built individually by hand (see steps here, here, and here), the capacitors have a 15 week lead time so it takes a while for them to come in. An SKBOWE kit costs around $100 USD – up to date pricing is on the order page. Wait, $100 and no HID bulbs or Ballasts????!!!! Yes, I know, it’s ridiculous compared with other error eliminators… But as described in the retrofit guide, it is only $20 more than a relay harness to do the same thing — that gets you a much cleaner install and keeps the factory bulb-out warning intact. The price is so high because I’ve used the highest quality components with insane safety margins and I and don’t cut any corners (small gauge wire, cheap caps, etc) to provide a product that will last the life of your vehicle. As I am building them myself at home in small quantities everything is more expensive than even a small scale operation in China would pay. I am selling these at my cost as a service to the community – I am not paying myself for the nearly two hours (see blog posts on assembly, potting, and finish work) labor required to making each pair. Everyone I know (including the wif) says I really should be selling them for more. If you are pissed about the price, call TRS or your favorite HID supplier and complain. Get them to make one for everyone! The plans are open source, and I am willing to help them free of charge. But be ready for a “sorry, there just aren’t enough people in the Volvo scene for it to be worth our time.” Also, you get what you pay for – even building 1000 of these the parts cost would still be around $60/pair… So if someone did produce this design commercially they would either sell them at the same price (but make money, unlike me) or use cheaper/inferior parts. You must have a PayPal account with a verified email address to order a SKBOWEv2. The account is free and you can use a credit card if you want to. Please see the orders page for instructions. Yes, but shipping costs will be higher, it will take longer to arrive, and you may have to pay VAT and/or import duties. PayPal will calculate international shipping cost based on your location. See the order page for additional information. If for whatever reason you’re not happy with the SKBOWE kit, you can ship it back within 30 days for a full refund. Although I’m not sure why you would be unhappy with it, after waiting all of this time to finally have a safe, functional, error-free HID retrofit working correctly. The SKBOWE warranted against defects in workmanship and materials for as long as you own your car. Limitations apply, complete warranty terms are attached HERE. 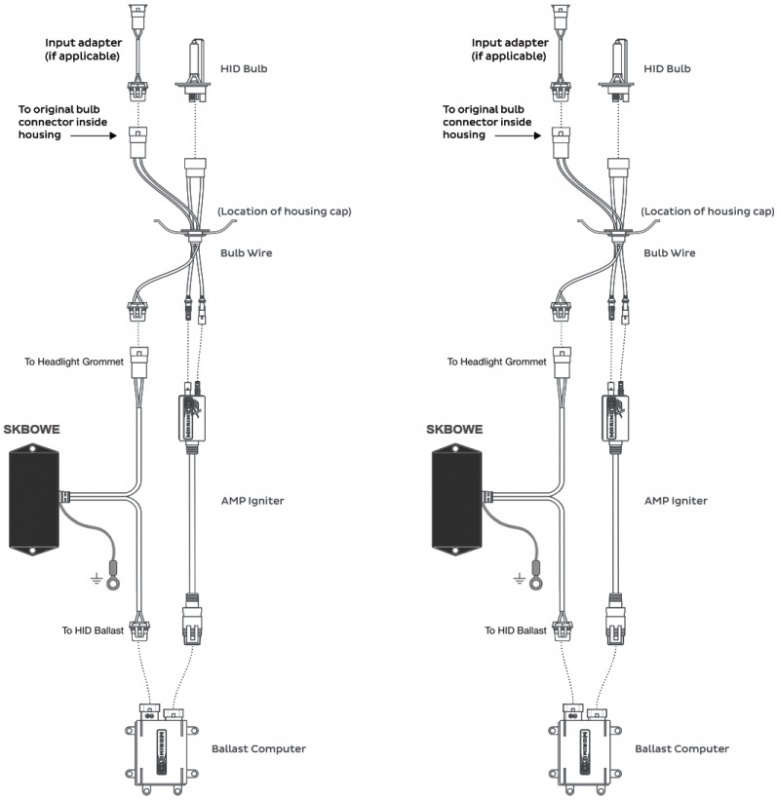 Check out the highly technical page on issues with P1 HID retrofits. You might also enjoy the blog post on a P1 CEM teardown, or my P1 CEM Headlight Simulator. You can also follow the SKBOWE blog for the latest updates on build progress and ballast reviews. For example, the classic “BOW3” harness (first sold by DDM, now widely distributed) has a 4700uF capacitor and some small inductors, and is good for PWM in the kHz range. I have seen 10mF capacitors sold by some vendors recently, but this is still at least 3 times smaller than what is necessary. 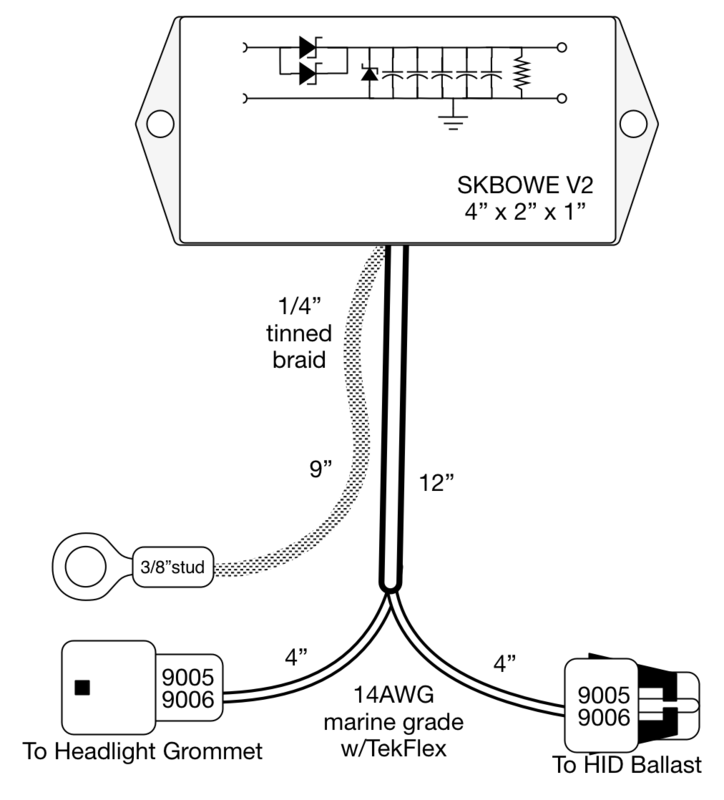 With the SKBOWE, there are no errors during normal operation, but If one of your ballasts or bulbs fail, you will get the “Low Beam Failure” message as the car was designed; With a relay harness, either the message is on all the time (no resistors) or off all the time (with resistors), but there is no indication of change during a failure of the ballasts or the relay. Capacitor selection subject to change, depending on availability. All aftermarket HID kits come with a 9005/9006 connector on the outside-the-headlight side that plugs into the ballast. The SKBOWE goes between the ballast end of the harness that passes through the headlight housing and the ballast. Both of these are 9005/9006 combo connectors.